On the cover of the local newspaper this morning is an article about me and my blog. It was fun to be interviewed by Nikki Gamer of the Marblehead Reporter. I have to admit I found it a bit unnerving to be the one written about. I’m just so use to being on the other side. 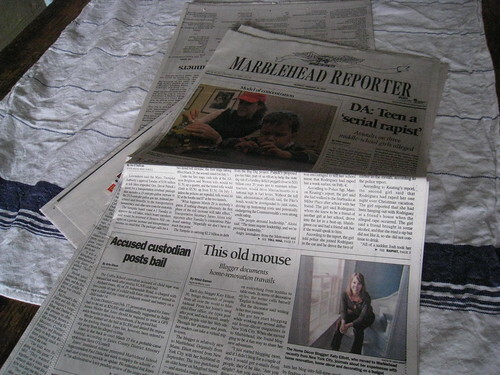 If you don’t live in Marblehead you can view the article online, wickedlocal.com. If you’ve found my blog via the Marblehead Reporter, welcome! I write a daily journal about design finds, decorating, and renovating an old house. Click on any image to the right for coverage on affordable artwork, my favorite interiors, colorful pillows, or just some lovely images of Marblehead. I've read many American blogs, and yours is perhaps one of the most visually appealing. Probably that's a compliment on your excellent and soothing color choices, and the uniqueness of your content. I'm reminded that a friend has blogged that she has deep contacts in the home renovation industry, so I'll suggest that she introduce your blog to advertisers in your market. Realistically, though, monetizing even such a worthy blog in these challenging times may be tough. A typo? In the first sentence on the "house renovations.html" page, I think the fourth word should be "you're". As one of the apparently thousands that enjoy your novel blog (and who can't wait until your next posting,) good luck with your incredible home project! Congratulations on the article… I really don't remember how I stumbled on your blog, but I've been reading for awhile now and I absolutely love your sense of style and artistic eye. Thanks for all the delicious eye candy and smiles! Great article and adorable picture! Big congrats on your awesomeness! Thanks guys for the support! I think I look like a goof grace! congrats katy!! that picture of you is so cute. go katy! Congrats. I love your answers! Hi Katy, I loved the article on you……you're darling in every single way. I'm sure the locals have taken great interest in you. What is the population of your community? I'll send you a link to my new blog when I feel a tiny bit more confident about it. So far, I've only sent it to my family. By the way, I'm the custom quilt maker in Dallas, Texas.